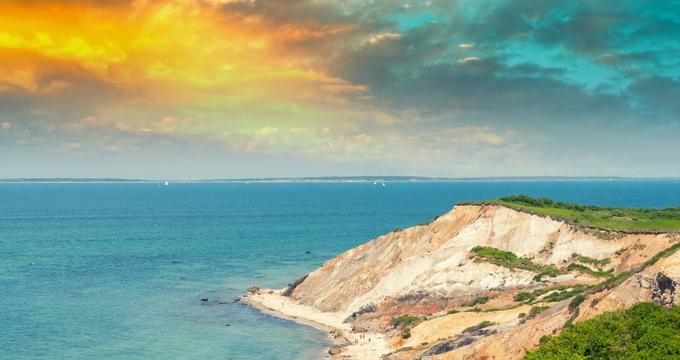 Massachusetts' long coast includes a number of spectacular beaches that range from the wide sandy flats of Cape Cod Bay to the magnificent bluffs of Martha's Vineyard. There are perfect swimming beaches protected from the huge waves, and others that are a thrill for surfers. There are beaches with miles of tide pools to explore, beaches surrounded by massive ancient dunes, and others lined with restaurants and bars, perfect for partying. Most beaches are wide and covered with soft, white packed sand and on a warm weekend or on holidays all of them get covered with sun worshipers and families enjoying a day by the water. Moshup Beach is a public beach in Aquinnah located just off the Moshup Trail on Martha's Vineyard in a scenic, remote part of the island on its western side. High above the beach is the 51-foot-tall red brick Gay Head Lighthouse, built in 1799 to warn sailors that they are approaching the island. The lighthouse is located on top of the 130-foot Gay Head Cliffs, which consist of colorful clay. The wide sandy beach has a “clothing optional” section, and there are a huge number of smooth rocks scattered across the soft white sand. There are wooden stairs leading from the cliff top to the beach. The surf on the beach can get fairly big and the undertow strong, so it is never crowded with swimmers, but the surfers love it. Chatham Lighthouse Beach, located just below the Chatham Light, a functioning lighthouse at the coast guard station, is the largest beach in the town of Chatham and is located only about half a mile from downtown. The wide scenic expanse of fine white sand is popular for nature walks to southern Monomoy Island. Animal lovers come to watch the daily migration of Chatham's seals as well as the many fishing boats both large and small. The currents at the beach are very strong and swimming is prohibited at the southern tip of the beach. There is a well-marked swimming area and there are no lifeguards, although there are beach patrols. The flag at the top of the stairs warns visitors of the dangerous conditions. The lighthouse above the beach is open to visitors during the summer. Coast Guard Beach in Eastham is a spectacular beach that is listed as one of the top ten in the country. There is a boardwalk that runs all the way to the wide sandy expanse, which is very popular for volleyball, boogie-boarding, surfing, and watching seals, which come very close. The beach is part of the National Seashore and is surrounded by ancient dunes and marshlands. While the beach is often crowded, after a short walk you can find a secluded spot and have a nice private time by the water. The waves are often very big and there are always surfers trying to catch the next big one. 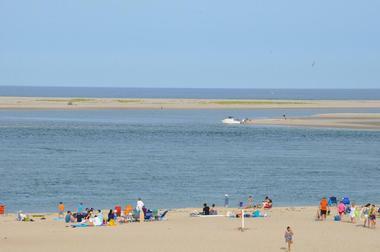 Craigville Beach is one of the most popular beaches in Barnstable. Located on Nantucket Sound, it is very large, with a wide expanse of fine white sand and while it is very popular and often full of noisy teens and families with kids, it is big enough not to feel crowded. There is always a volleyball game going on and the beach is long enough for a nice lengthy walk by the water. It is popular with swimmers and sunbathers and has lifeguards until Labor Day. There is a restaurant across the street as well as a place renting out umbrella and chairs. Crane Beach in Ipswich is a large, 1,234-acre very popular beach that is considered one of the most beautiful on the East Coast. Clean white sands, calm blue water, miles of shoreline, and breathtaking views make this beach one of the most popular holiday and weekend destinations. There are kids playing in sand, swimming, playing volleyball, or enjoying the sun, and there is something for everyone. The beach is surrounded by large dunes that protect the coast from storms. There is a 5-mile long trail that meanders across the dunes and salt marshes and through one of the largest pitch pine forests on the North Shore. Located in eastern Massachusetts in its southernmost part, Horseneck Beach State Reservation is a 600-acre salt marsh and barrier beach. The 2-mile long beach, part of Buzzards Bay, is breezy, pleasant, south-facing, and very popular among surfers; perfect for a cooling swim during the hot summer months. The beach and the marshes next to it comprise one of the major bird nesting habitats in the area. 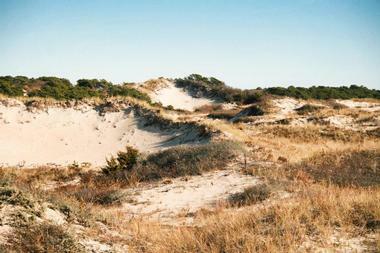 Behind the dunes, near a rocky headland called Gooseberry Neck located at the eastern end of the Reservation, is a well-organized 100-site campground. There are designated spots for swimming. Pets are not allowed on the beach. Marconi Beach is a huge, wide beach in Wellfleet, Cape Cod, surrounded by large dunes and often pounded by large waves that attract surfers and boogieboarders. The beach is part of the Cape Cod National Seashore. 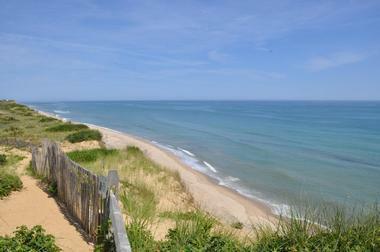 There are spectacular views from the bluff on top of the dunes of Cape Cod Bay, Atlantic Ocean, and the Outer Cape. There are wooden stairs that go from the dunes to the beach. The beach is very popular and can get crowded on weekends and holidays, with the sea of colorful umbrellas creating a pretty picture from above. There are designated spots for swimming and guards are on duty during the season. The beach is great for long hikes, watching the frequently visiting seals, playing volleyball, or making sandcastles. Bathrooms and outdoor showers are available. Mayflower Beach is a large, beautiful, calm beach on Cape Cod Bay, a part of the northern Dennis shoreline that stretches from Nobscusset Point to Chapin Beach. This public beach is wide and the packed sand is perfect for Frisbee games, volleyballs, and other sports. There are lifeguards on duty, a short boardwalk, public restrooms, and a picnic area. At low tide, the beach has miles of tidal flats and small shallow pools, perfect for the kids to look at the small animals that get trapped in them. If you want to have a nice long walk, you can reach the Bayview Beach that connects to the Mayflower. 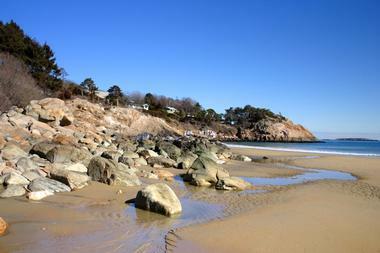 Mayo Beach is narrow, fairly long beach in Wellfleet that overlooks Wellfleet Harbor, near the Breakwater Light. Swimming is good only at high tide but the beach gets much narrower as it loses lot of ground. At low tide, it gets muddy and full of shells, but the water is warm and calm and fun to explore. The beach is surrounded by expanses of beach grass. The view of the rock jetty, the dunes of Great Island, and boats heading into the harbor is breathtaking. There is a kids’ playground at Baker’s Field just across the street and a bike rack at the beach entrance. The beach is regularly used for yoga classes. Menemsha is the last working fishing village on Martha’s Vineyard. Located in the town of Chilmark, the Menemsha public beach is easily accessible, even by bike. The beach is a bit rocky but it has a soft, gentle surf since it faces the Vineyard Sound and not the Atlantic Ocean. The beach is safe for swimming, with warm water and lifeguards on duty. The beach has fantastic views of Cuttyhunk and the other Elizabeth Islands and is the premier spot to watch the sunset on Martha’s Vineyard. 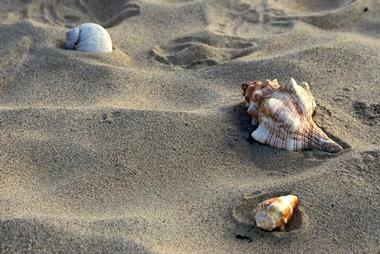 The wide expanse of beach is great for long walks and there are always interesting shells to be collected. As a working fishing village, Menemsha has excellent seafood restaurants, and you can also try to catch your own dinner from the long jetty. The oldest public beach in the country, Revere Beach is a 3-mile long crescent overlooking Massachusetts Bay, less than 5 miles from downtown Boston. Established in 1896, this beach is so popular, it is crowded even on work days. The wide strip of bright white sand is always full of sunbathers, kids having fun in the sand, and swimmers, but the beach is much more about partying and socializing than about swimming. Among the many activities going on at the beach is a Revere Beach Sand Sculpting Contest, the biggest of its kind on the East Coast. Just across the road from the beach are many restaurant, bars, and cafes. Singing Beach is a beautiful, large, half-mile-wide beach in Manchester-by-the-Sea, with a famous bathhouse built in the early 1920s and a nice, small canteen with snacks. The beach has public bathrooms, showers, and changing stalls as well as fairly large parking lot. The beach has designated swimming areas with attending lifeguards as well as areas for sports. Above the beach is a grassy area with benches and a shady canopy of trees. 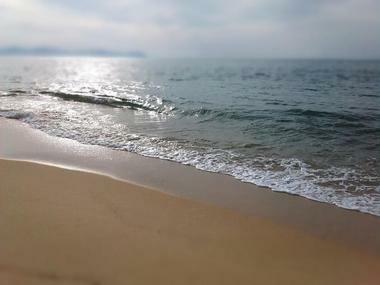 There is a trail along the beach, but walking on the sand or at the edge of the water is a pure pleasure with the firmly packed sand. The beach got its name from the sound the sand grains make when they rub against each other inder certain conditions, a phenomenon not completely scientifically explained but fun nevertheless. Located in Boston Harbor only 20 minutes from downtown Boston, Spectacle Island is a perfect 105-acre spot for hiking, relaxing, swimming, and boating. It has an interesting visitor center, where you can learn about the island history and development. The island has several nice sandy beaches. The main one is just north of the marina and the dock and has a lifeguard, changing areas, showers, and bathrooms. There are 5 miles of hiking trails through the densely forested island and the view from the top of the 157-foot-high hill of the city and harbor is fantastic. There are ranger-organized tours of the island.